UVACollab HelpUVACollab DocumentationFor Students Media GalleryHow do I copy embed code for public display on the web? 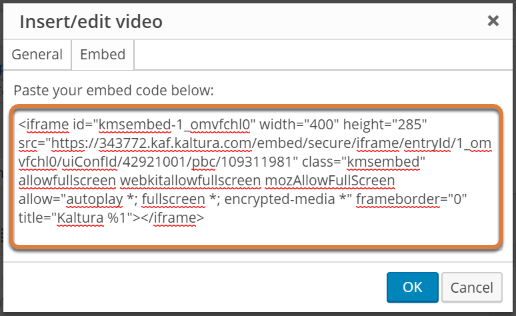 In the Media Gallery of a UVACollab site you own, you can enable the Embed Grab option to generate embed codes. 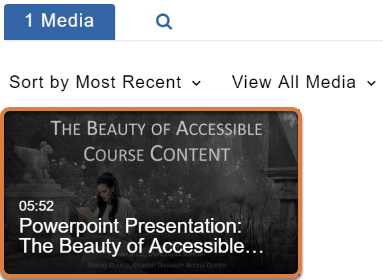 You can add a video or audio file to the Media Gallery in your site to copy the file's embed code for use in sites outside of UVACollab (e.g., WordPress sites or ePortfolios). 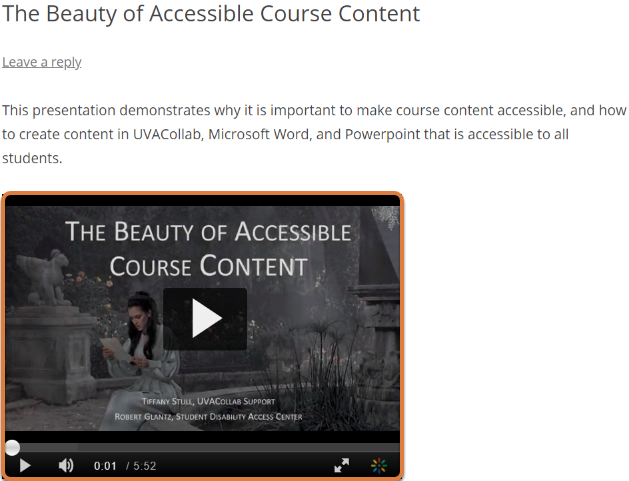 Have or create a UVACollab site with Media Gallery. Navigate to your UVACollab site. Add Media Gallery to your site (if not already present). Edit the Media Gallery's settings to enable the Embed Grab option. 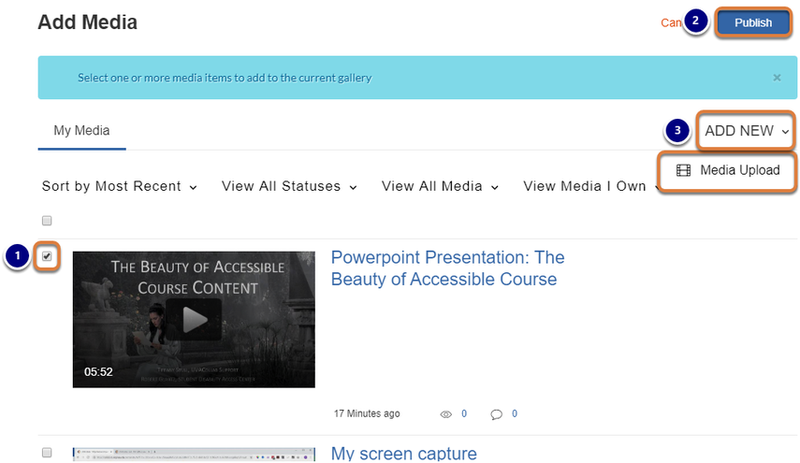 Add your video or audio file to the Media Gallery (if not already added). Tip: To embed Media Gallery files in a UVACollab site, follow the steps in How do I embed a Media Gallery file in the Rich-Text Editor? 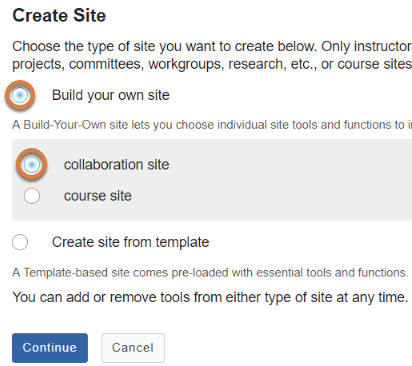 If you do not yet have a UVACollab site created, follow the steps in How do I create a new course or collaboration site? to create a new site. If you will only be using this site to store videos and generate embed codes, it is recommended to create a collaboration site using the Build your own site option for this purpose. At the step where you select site tools, select Media Gallery. Select the site where you will add the videos. If the Media Gallery tool is not already in your site, follow the steps in How do I add a tool to my site? At the step Select your set of tools, select Media Gallery. Select the Media Gallery tool from the Tool Menu in your site. Select the Actions menu (three bars icon), then Edit. Scroll down on the page to the Options section, and select the Enable Embed Grab check box. Note: With the Embed Grab option enabled, public embed codes will be created for all media in your site's Media Gallery. It is not recommended to enable this option in a site with copyrighted materials. Instead, we recommend you create a collaboration site to store all of your publicly viewable media. 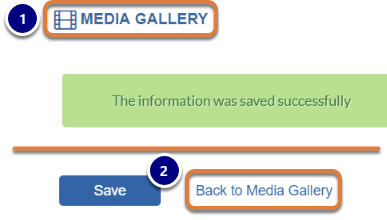 Or select the Back to Media Gallery link at the bottom of the page (next to the Save button). Select the + Add Media button. Note: On mobile devices or small screens, the button displays a plus sign (+). Select or upload your media. Select the check box(es) for the media item(s) to add. At the top of the screen, select Publish. Or, if you do not yet have media uploaded, select the ADD NEW menu, then Media Upload to upload a new file. In the Media tab, select the video or audio file. Select the Details menu, then Share. Select the code in the Embed box and copy it to your computer's clipboard (CTRL+C on a PC or Command+C on a Mac). Use the embed code in your web page. You can now paste the embed code into an external web page, such as a WordPress page or ePortfolio. When the page with the embedded video or audio file is posted, you will be able to play it. Prev: How do I upload a video or audio file to Media Gallery? Next: How do I join a group?